In recent years, Nebraska has earned a reputation for great golf. That recognition is centered in the Sandhills region, where courses such as The Prairie Club and Wild Horse have made several lists of top courses. But there's another lesser-known course that deserves to be considered among the best in the state. Bayside Golf Club doesn't sound like a prairie course. Where do you find a bay in Nebraska? But it's located near the shores of Lake McConaughy, a 22-mile-long reservoir that offers abundant water-related recreation. Bayside was designed by Dan Axland and Dave Proctor, the team that designed Wild Horse at Gothenburg, Nebraska, and worked on the famed Sand Hills Golf Club near Mullen, Nebraska. Golfers will notice a similarity to Wild Horse, but there are some distinct differences. Bayside follows the natural contours of the land, but the terrain is more hilly and rugged so you'll find some elevation changes at Bayside. You won't see any water hazards, but plenty of vegetation and bunkers defend the course. Most holes require a carry across native grass to reach the fairway or green. Each hole has a name; Temptation, Braveheart, Humility-and Forever. Stop for a moment and imagine what a hole called "Forever" might look like; now add about 100 yards. Forever is No. 11, a 652-yard, par-5 from the back tees. Be sure to pack a lunch for this one. The fairway narrows as you journey closer to the green. Approach shots require a deft touch, because it's easy to slide into a greenside bunker. Speaking of bunkers, more than 20 line the fairway and surround the green. No. 17, known as Short but Sweet, features a bunker in the middle of the green. The cool thing is the contours of the green allow for creative putting lines around the sand if you need to take an indirect route to the cup. The fairways are in great condition, and the smooth, fast greens feature challenging slopes and swales. 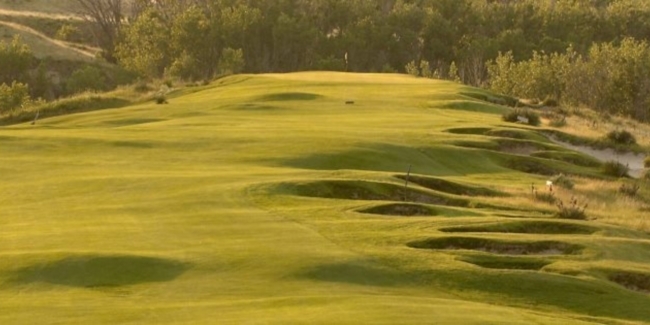 Bayside Golf Club offers Sandhills scenery and risk-reward golf in a very playable layout. Five sets of tees allow golfers of all abilities the opportunity to enjoy this par-72 course that measures about 6,600 yards from the back tees. Bayside includes several well-furnished cabins and an onsite restaurant for guests. Rates are affordable; 18 holes with a cart is $50 Monday-Thursday and $60 on weekends. The club also offers specials through the Play the West golf package. You can learn more about the course and accommodations at BaysideGolf.com.